ScanEx Image Processor es una aplicación destinada a la correción geométrica y radiométrica de datos obtenidos por satélites u otros medios aéreos. Además, permite el procesado de los datos corregidos geométricamente y la creación de aplicaciones propias. and a module for creation of georeferenced multi-image map layouts. ScanEx Image Processor helps to create colour-balanced mosaics from different types of images. A contrast smoothing is provide on-the-fly. It is possible both to “patch” a defect in an image (for example, a cloud-covered area) using another image and to mosaic the images to obtain a united raster coverage. The software implements image fusion/resolution merge by combining multispectral images and panchromatic images of higher spatial resolution. Two methods are used: i) principal components analysis; ii) principal components analysis and wavelet decomposition of images. There are options to vary image fusion parameters and to preview the results in real time. The module provides the creation of various higher processing level and thematic products (e.g. calculation of the “blue” spectral band from other bands of a multispectral image for natural-colour transform; calculation of vegetation indices, such as NDVI, etc.). There is an option to calculate linear and non-parametric regressions. Tools are available for the users to create their own models. The application implements several widely used methods to detect the changes of spatial objects and one alternative method based on principal components analysis of images. 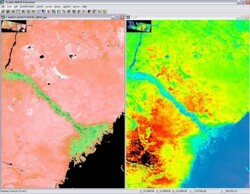 It is possible to calculate a number of thematic MODIS products in ScanEx Image Processor on the basis of standard algorithms developed within the framework of EOS programme. These are the cloud mask, the snow/ice cover mask, the Earth surface temperature mask, the vegetation indices, and the active fires mask. The output module of ScanEx Image Processor allows to prepare the image processing results for printing. Thematic maps and map layouts can be created featuring multiple image and map frames with georeferencing information. 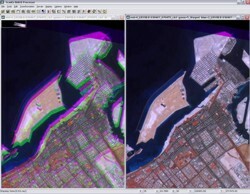 ScanEx Image Processor can implement geometric correction both with a predetermined geographical grid of latitude/longitude and with ground control points. A built-in correlator provides for semi-automatic image georeferencing (including images of different resolution and obtained form different sensors) withe the accuracy of 0.5 pixel of the coarser image. Besides, ground control points can be added manually. The application offers two methods of geometric correction on the basis of ground control points: global and local transformations. The global transformations is performed with one of the three available models: rigid (formulae) transformation, affine model, projective model. The local transformations are effected with the anisotropic radial basis functions which allow to approximate arbitrary geometric transformations on-the-fly. ScanEx Image Processor implements three alternative resampling methods on the basis of rectangular, triangular and cubical Hermite spline filters. These convolution filter methods allow the user to reduce the loss in image quality after resampling by means of a matched brightness interpolation across the whole image area. Procedures for modelling and visualisation of 3-D landscapes is provided. Digital elevation models are used for the modelling along with remote sensing data; besides, it is possible to use vector data and 3-D models, to simulate cloud cover including animated clouds. ScanEx Image Processor is capable of real-time high-quality flight simulation over texturised 3-D models more than 30,000 х 30,000 pixels in size. It is possible to save the flight track and record it as a video clip. The control over the 3-D flight simulation may be exercised with the help of keyboard, mouse and joystick.